A homeless Madonna cradles the Son of God under the glare of a street lamp as she squats beneath an urban bridge. A haunting figure of Christ takes last supper with civil rights demonstrators at a southern lunch counter sit-in. The head of Jesus, coifed in a 1960s Afro, droops as his body hangs from a cross-draped with a lynching rope. In the 53 stained glass windows that embellish the newly-built sanctuary of the St. Luke �Community� United Methodist Church in, Dallas, Texas, there are no traditional manger scenes, no blue-eyed prophets, no star-lit shepherd journeys. Old and New Testament figures, finally true to their geographic origins, inhabit dark skin, while ancient and modern symbols interweave to give new relevance to timeless images. 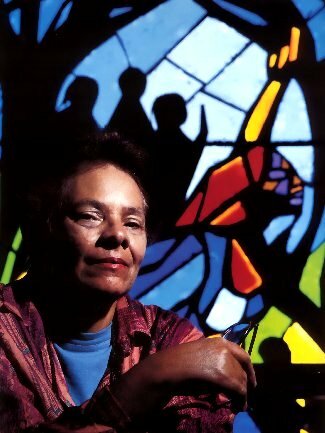 In designing a tribute to black history, from biblical times throughout the Civil Rights Movement, African-American artist Jean Lacy has discarded the sacrosanct images and icons of traditional liturgical art. In their place are new ones - icons for the iconoclast - which reflects the African odyssey throughout history from the creation to the Diaspora, from the Great Migration to the U.S. Civil Rights Movement. It is this theme of triumphs of the human spirit and in particular the African-American�s, that dominates the windows at St. Luke. When the church�s pastor, the Rev. Zan W. Holmes Jr., and his congregation realized they had outgrown their 100-year-old space in South Dallas, and decided to annex a new home next to the old one; their mission was clear - to create a sanctuary that would emphatically reflect the church's African-based ministry. �At St. Luke, we try to help our congregation better understand our African heritage and its relationship to biblical faith,� said Rev. Holmes, St. Luke's pastor of 20 years. �We consider ourselves to be an Afrocentric congregation, and we wanted these windows to reflect that.� Holmes and his congregation also wanted to make another statement - that the Bible is populated with people of color, including Moses, Simon of Syrene, Esther and Jesus himself.